The rules of making money have changed-forever With the collapse of investment banks, trillion-dollar-plus government bailouts, and the Dow plunging like a rock, it's never been more important to understand-and actually profit from-the "new rules." Fact is, Fiscal Hangover, will give you an investing blueprint that will allow you to profit from the changing global economy. For the first time in 200 years, American consumers are stepping down from their position as the driving force behind the world's economy. In Fiscal Hangover, Keith Fitz-Gerald analyzes the declining power of the American consumer and introduces you to the resulting investment opportunities. Without question, the American consumer and the United States government have provided the rest of the world with liquidity in the form of cheap capital and abundant debt. But in light of recent economic events, the rules of the game have changed and that means you must change with them-if you intend on securing your financial future. 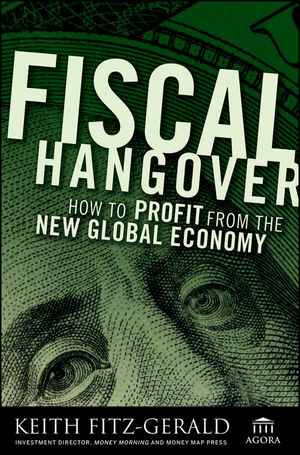 Unlike most of today's finance books that simply examine the end of the American Empire, Fiscal Hangover shows you how to prepare for the fall, effectively allocate your investments, and thrive in the new global economy. This book offers specific analysis and concrete actionable steps for individual investors interested in grabbing their fair share of what will be the greatest wealth creation in the history of mankind. The coming years may hold the greatest investment opportunities of our times, but in order to take advantage of this you'll need the insights that can only be found in Fiscal Hangover. Keith Fitz-Gerald is the Investment Director for Money Map Press (www.moneymappress.com), as well as Money Morning with over 500,000 daily readers. He is one of the world's leading experts on global investing, particularly when it comes to Asia's emergence as a global powerhouse. Fitz-Gerald's specialized investment research services, the Money Map Report (www.moneymapreport.com) and the New China Trader lead the way in financial analysis and investing recommendations for the new economy. Fitz-Gerald is a former professional trade advisor and licensed CTA who advised institutions and qualified individuals on global futures trading and hedging. He is a Fellow of the Kenos Circle, a think tank based in Vienna, Austria, dedicated to the identification of economic and financial trends using the science of complexity. Fitz-Gerald splits his time between the United States and Japan with his wife and two children and regularly travels the world in search of investment opportunities others don't yet see or understand. Introduction: A Refresher Course in Granny's Wisdom. Part I America's Fiscal Hangover and the Binge That Got Us Here. Chapter 1: History 101 – From 13 Colonies to Global Economic Power. Chapter 2: Growth of the American Consumer – Role Model for World Spending. Chapter 3: The Beginnings of America's Undoing. Chapter 4: 'Bubble' Gum – How We All Finally Got Stuck. Part II The Great Decoupling. Chapter 5: Wait a Minute! We've Seen This Before (But We Still Haven't Learned). Chapter 6: America's Economy and Its Place in the New World Order. Chapter 7: Consumerism on the Move – An Engine for Recovery. Part III Dr. Fitz-Gerald's Amazing Home Remedy for Hangover Relief. Chapter 8: The World's Changing Investment Landscape. Chapter 9: The New Money Rules, and Why You Must Follow Them. Chapter 10: Go Global or Go Home – Where To Make Your Future Fortune. Chapter 11: Brass Tacks – Key Countries, Sectors, Industries and Companies. Chapter 12: Never Get Fooled Again – The Pyramid Strategies. Conclusion: 10 More Rules for Successful Investing. Appendix: The $300 Trillion Recovery Almost Nobody's Talking About.